BSRT has teamed with Super Tires to put together an extensive line of slip-on silicone tires for your H.O. scale slot car. Designed to work in tandem with BSRT's G3 line-up of cars, they come in both narrow and wide slip-on tires. 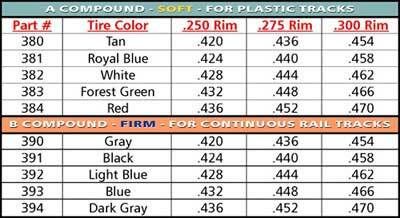 Narrow slip-on tires are made to fit BSRT's HT267 and HT268 Narrow Double-Flanged Rims while the wide slip-ons on sized to fit BSRT's HT257, HT258, and HT259 Wide Double-Flanged Rims. No part of this web site may be reproduced or transmitted inany other form or means without the prior written permission of Scale Auto.